I am the proud owner of gilt palm tree with scarlet dates that I shall use as the centrepiece of my Christmas dining table. In December 2017, I was asked to open an exhibition of Bahraini art in the Saatchi Gallery. I hope I was suitably gracious and encouraging, and the palm tree in its gorgeous satin tabernacle was my reward. The art in the exhibition was a mixture of abstract, geometric, and vaguely conceptual painting, spiced with a flavour of its origins. It was polite and lacked the encoded edginess of Saudi art, which is the most interesting in the region, but it was creditable for a small city state where the making of art in the western sense is only a few decades old. The exhibition was under the auspices of the King of Bahrain’s wife, Sabeeka bint Ibrahim Al Khalifa. 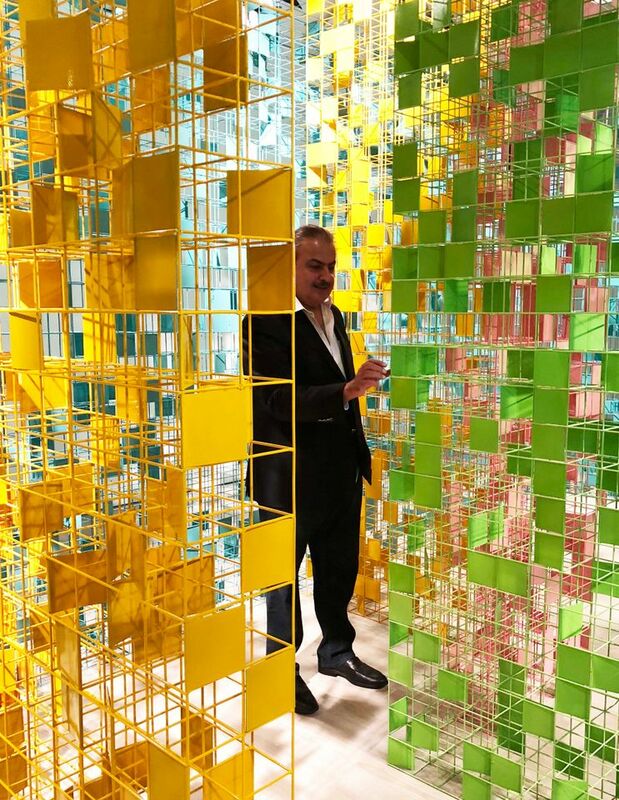 Bahrain is on show in the Saatchi Gallery again, with an exhibition of a single artist who is also one of the major patrons of the art scene there, Rashid bin Khalifa Al Khalifa (Penumbra: textured shadow, coloured light, until 19 November). He is a cousin of the ruler and has occupied the positions of undersecretary for tourism and culture and for immigration, passports and nationality at the same time as practising his art. This is both an advantage and a disadvantage. Now 66 years old, when he said that he wanted to be an artist and went to study at Brighton and Hastings College of Arts in 1972, his family thought it was a harmless eccentricity. But in small communities like Bahrain, where royalty can set a trend that others then feel reassured in following, he has helped the art scene develop just by existing, quite apart from the results of his direct patronage as president of the Bahrain Arts Society. “Nevertheless, my family still only believe that it’s worthwhile if someone from outside says so,” he told me. He has evolved from painting impressionistic landscapes through abstracts to metal wall sculptures. These are intricate, vividly coloured, convex, openwork panels, which, he says, are inspired by the mashrabiya window screens of the Middle East, although they could equally well be put in the tradition of Op art—think of the Venezuelan artist Jesús Rafael Soto, for example. One room is filled with a particularly pleasing, delicate, maze-like structure in yellow and green, like a spring wood, with kinetic effect as you walk through it. The works are assured, well proportioned and visually satisfying, and even though they are not in the vanguard conceptually, they are considerably less dull to look at than many better known oeuvres in the west—for example, the quilted white canvases produced over and over again by the Italian artist Enrico Castellani, which are getting the full market treatment at the moment as Italian post-war art is being rediscovered. There are other exhibitions of Al Khalifa’s work being planned in other countries, and these may liberate him artistically. For while he does not use his title in the art world, he cannot avoid the fact that in the region, everyone knows who he is. It guarantees him respectful shows there, but it also anchors him too firmly to his little city state because of the tribal nature of life. If Sharjah and Abu Dhabi, both members of the UAE, do not interchange culturally except on the most superficial level, this is even more true for the states beyond. Above all, it is difficult for the artists in the Gulf to experience the friction of a really diverse society of equals and of frank criticism, the grit in the system that produces the big pearls.